What Else Can I Expect From an Online Master's in Homeland Security Program? Homeland security is a relatively new term referring to the systems, resources and personnel in place to respond to terrorist attacks, natural disasters, and other large-scale emergency situations that threaten people and property in the United States. The Department of Homeland Security (DHS) was launched in 2002 (largely in response to the 9/11 attacks), and has since grown into one of the largest federal agencies; DHS currently employs more than 240,000 full- and part-time staff working in areas like airport and border security, cyberterrorism, emergency response, and public health. The academic discipline of homeland security is concentrated in the laws, ethics, protocols, and processes that guide various federal and nonprofit agencies. Coursework will cover a wide array of topics related to different branches of homeland security like terrorism, health, and resource protection. Most careers in homeland security are attainable with a bachelor's degree ― or less, in some cases ― but a master's degree in homeland security is the ideal pathway for students who plan to assume leadership positions after graduation. Master's in homeland security programs often culminate in a capstone course, during which students must use the skills and knowledge they have gained to address real-world concerns related to public safety and security. Internships may be required, as well. Many of today's students are choosing to earn their master's degree in homeland security online, rather than in a classroom. Web-based students follow the same rigorous curriculum as their brick-and-mortar counterparts, often leading to the same number of post-degree job opportunities. The flexible, study-from-home schedule are ideal for students with part-time jobs, childcare duties and other important commitments. Learn more about what you can do with an online master's degree in homeland security and what kind of career opportunities you can look forward to with this comprehensive guide. Many of the fields that graduates are prepared to enter will experience above-average growth rates, according to the Bureau of Labor Statistics. Professionals with a master's degree also have a higher earning potential. Read more here.. Graduates are prepared for many careers, including emergency management specialist, emergency response coordinator. and disaster recovery coordinator. Read more here.. Homeland security refers to the systems, resources, and personnel used to respond to terrorist attacks, natural disasters, and other emergency situations. The academic side of homeland security focuses on the laws, ethics, and protocols, that guide various federal and nonprofit agencies. Read more here.. Many colleges offer a master's in homeland security, either online or on-campus. This includes George Washington University, Mississippi College, and Nova Southeastern University. Read more here..
WHAT DEGREE DO YOU NEED TO WORK IN HOMELAND SECURITY? Most master's in homeland security programs require applicants to have an accredited undergraduate degree, which does need to be in any specific field. However, students with a degree in an unrelated field may be required to complete prerequisite courses. Read more here..
WILL AN ONLINE MASTER'S IN HOMELAND SECURITY PROGRAM PROVIDE ME WITH THE SKILLS I NEED TO ADVANCE MY CAREER? A master's degree in homeland security will prepare students for the challenges of this demanding ― yet often rewarding ― career path. Many programs allow students to concentrate their studies on specific areas of homeland security, such as cybersecurity, chemical warfare, narcotics, and public health. Those who follow a specialized track will be especially well-positioned for job opportunities in their chosen niche field. Capstone experiences and internships further boost a student's career prospects by exposing them to real-world problems and conditions they can expect to encounter upon entering the workforce. WILL AN ONLINE MASTER'S IN HOMELAND SECURITY PROGRAM WORK WITH MY SCHEDULE? Online master's degree programs offer a flexible, easily accessible alternative to traditional higher education. Students are able to download course lectures and readings, participate in virtual discussions with other students, submit written assignments, take exams and communicate with their professors from their home with minimal (if any) required campus visits. Current technology also enables them to study on the go using a laptop, tablet, smartphone and other portable Wi-Fi devices. For added convenience, students can usually coordinate internships at locations that are reasonably close to their current residence. WHAT JOBS CAN I GET WITH MY MASTER'S DEGREE IN HOMELAND SECURITY? Job eligibility for online master's in homeland security degree recipients will largely depend on their chosen specialization. Those who concentrate their studies on cybersecurity and digital forensics will be well-positioned for careers in IT, while a specialization in epidemiology or disease prevention will be the ideal track for a career in public health. Other common roles for these degree-holders include emergency management directors, information security analysts, logisticians, and security consultants. Doctoral degrees in homeland security are quite rare, so the master's is considered a terminal degree path. WHAT ARE THE BEST ONLINE MASTER'S IN HOMELAND SECURITY PROGRAMS? Choosing a program is an incredibly personal decision, and only you can properly evaluate whether a target school's strengths match your educational needs. The following ranked list of schools should serve as a helpful starting point in your search for the best online master's degree in homeland security programs in the United States. Our ranking is based on the courses schools offer, available specializations, student outcomes, career support services, and other criteria used to determine academic excellence. If you are considering an online master's in homeland security, be sure to contact admissions specialists at different colleges and universities to learn more their about specific requirements and offerings. The Francis King Carey School of Law was established at the University of Maryland, Baltimore in 1816, making it the third-oldest law school in the nation. Its location on the Founding Campus of the University of Maryland make it an integral part of the legal and business community in the Baltimore and D.C. areas. The school offers an online master’s in homeland security and crisis management law. The degree prepares students to take charge of responses to crisis situations. Coursework features focus on the regulatory, legal, and public issues associated with crisis management situations, including terrorist attacks, pandemics, and other large-scale crises that require collaboration among governments, medical facilities, businesses, and law enforcement agencies. Students benefit from access to instructors with membership at Maryland Carey Law and from experts at the university’s Center for Health and Homeland Security. Students set their own schedules to balance class time with personal and professional obligations. After taking an initial semester of core courses, students take survey courses in homeland security and crisis management followed by seminars that cover topics like cybersecurity, emergency public health response, emergency management, and homeland security and counterterrorism. At the end of the program, learners complete a capstone project focused on a practical challenge of their choice. Students exit the program with the skills needed to work with government and medical agencies and with public and private organizations to coordinate response teams and quell crises. George Washington University was founded in Washington, D.C. in 1821. The school serves more than 20,000 students across a wide variety of programs at three campuses and through online programs. The school offers several online degrees, including a master’s in homeland security online. The master of professional studies in homeland security prepares students to work at government agencies, private institutions, and medical facilities providing security in emergency situations. Faculty members with professional backgrounds in security and safety provide first-hand insight into homeland security, and the program’s online format allows working professionals to balance their personal lives with a higher education experience that will help them advance their professional careers. The 36-credit curriculum addresses homeland security policy and issues on both a regional and local level. Students typically complete the degree in about 16 to 24 months, and the course sequences includes 12 three-credit courses completed over four semesters -- each lasting eight or 16 weeks. Examples of courses include political violence and terrorism, methods of analysis in security, interagency cooperation, and managing the politics of leadership. Students also work through a capstone project in the final semester. Upon completion of the program, students work as leaders in homeland security, cooperating with multiple agencies in need of strategic analysis and safety solutions. Located in Clinton, Mississippi College is a private co-educational Christian university serving nearly 5,000 students. Its vision “to be known as a university recognized for academic excellence and commitment to the cause of Christ” guides its on-campus and online program objectives. The school offers students the ability to earn an online master’s degree in homeland security through its master of social science program with a homeland security concentration. The degree helps professionals enter antiterrorism careers by getting comprehensive education and training in homeland security issues and general issues concerned with the administration of justice. Graduates of the program pursue careers at several federal agencies, including Immigration and Customs Enforcement, Citizenship and Immigration Services, the Transportation and Security Administration, the Federal Emergency Management Agency, and the Office of the Inspector General. The school provides distance learners with coursework taught by experienced security professionals. Coursework includes a general introduction to homeland security, grant writing for homeland security, special issues in homeland security, and legal aspects of homeland security, among others. The online nature of the program allows students to balance their education with their personal and professional lives. Graduates of the homeland security program seek careers as asylum officers, policy analysts, border patrol agents, and more. The smaller student body allows the school to offer smaller class sizes, giving individuals greater access to their instructors as they work toward their degrees. The school is regionally accredited by the Southern Association of Colleges and Schools Commission on Colleges. Nova Southeastern University is located near South Beach, Florida. NSU's Department of History and Political Science offers an online MS in National Security Affairs with four options for specializations within the program: cyber terrorism and security, criminal justice, homeland security, or international relations and global affairs. To earn this homeland security degree online, students must complete a core of five courses made up of 15 credits in total. These courses are offered by the College of Arts, Humanities, and Social Sciences and include subjects such as theoretical and practical studies of terrorism. Study is conducted asynchronously through the Blackboard platform. The program culminates in a tabletop exam available three times a year in January, May, and August. The exam is open for a 24-hour period. Both the online master's in homeland security track and the international relations and global affairs track feature an optional field research project where students can earn credit for practical experience. Each of the four specializations include specialty courses. For example, the cyber terrorism specialization includes courses in information security and security technologies. The criminal justice track includes courses in legal regulations, social administration, policy making, and investigative processes. The homeland security track includes courses that cover dealing with intelligence, counterintelligence, community-based conflicts, metropolitan conflict, crisis managements, and critical incidents response. The global affairs specialization includes courses in genocide studies, civil wars, international war, the social aspects of terrorism, and theories of ethnicity and nationalism. In addition to regular classes, students can take part in several support activities designed to improve student life and future employability, such as the mock trial skills workshop and the model United Nations team. Standardized tests: None. Academic writing sample required. Non-native English speakers must provide a passing TOEFL or ILETS score. Located in Boston, Northeastern University aims to create a holistic, distinctive approach to research and education. Founded in 1898, the school offers a range of graduate and undergraduate programs across multiple campuses and online. Northeastern offers a master’s in homeland security online focused on emergency management. The school aims to educate the next generation of homeland security professionals and emergency managers interested in taking leadership positions at both public and private institutions. Students in the MA in homeland security program choose one of three concentrations: emergency management and geographic information technologies, port security and organization, or infrastructure continuity. Throughout the program, students benefit from the university’s ALERT Center which encourages student learning through collaboration. The center is listed as a Department of Homeland Security Center of Excellence, one of 12 such centers throughout the country. The center conducts high-level research and features important technology and opportunities for educational development, training students in effective responses to threats. In total, students take 45 to 47 quarter hours of coursework, with opportunities for two elective courses related to national security issues. Northeastern’s MA in homeland security program allows graduate of the National Guard Bureau Homeland Security Institute to transfer 12 credits toward the program. Students of the program benefit not only from the completely online format of the program, but also the ability to connect with a large network of security employers, including the FBI, U.S. Secret Service, Department of State, Department of Homeland Security and the Massachusetts Emergency Management Agency. Located in Lynchburg, Virginia, Liberty University offers 550 programs both on campus and online in studies ranging from the certificate to the doctoral level. This Christian-focused school combines the professionalism of a traditional degree with a faith-based education. The school boasts a wide variety of online degree programs, including an MS program that allows students to earn their homeland security master’s degree online. The school’s master’s of science in criminal justice with a concentration in homeland security is a 100% online program designed to train professionals in the criminal justice space to take leadership roles in management at homeland security agencies. The program includes 36 credit hours of coursework, with admissions allowing up to 50% of those hours to transfer into the program. Courses cover a broad spectrum of homeland security topics, including foundations of homeland security, legal issues in homeland security, and homeland security organization and administration. All graduates complete a thesis on a subject of their choosing. For current military service members, spouses of military service members, veterans, or employees of the Department of Defense, Liberty offers special benefits, including tuition discounts of $275 per credit hour (with additional discounts for veterans who serve as an emergency responder in a civilian capacity), eight-week courses with eight start dates each year, no set login times, no application fees, and earned college credit for military training. Applicants already possess a regionally or nationally accredited bachelor’s degree with at least a 3.0. Many graduates of Liberty’s online homeland security master’s program work in customs and immigration, emergency management, law enforcement supervision, and government security. Excelsior College is based in Albany, New York, and offers the homeland security online degree, a MS in criminal justice (homeland security and emergency management). The homeland security and emergency management concentration program has 30 credits and is made up of 10 graduate courses and a capstone. The MS in criminal justice program shares its core courses with all available concentrations, such as a course in quantitative analysis for criminal justice. The homeland security and emergency management concentration courses are made up of nine credits, in subjects such as homeland security, emergency management, and geopolitical brinksmanship. Excelsior College offers a generous transfer policy, allowing up to 15 credits from accredited institutions or translatable credits from relevant professional experience to be applied towards the master's degree. The program is made up of eight-week courses per trimester; this timeframe allows students the possibility of completing their degree in less than two years. Students have access to 24-hour technology assistance online, as well as access to the Sheridan Libraries of John Hopkins University. Excelsior College's School of Public Service is affiliated with the National Cybersecurity Institute Research Center, located in Washington D.C. Excelsior College has been awarded a National Center of Academic Excellence in Cyber Defense Education by the Department of Homeland Security, and the National Security Agency, a designation which is valid until 2019. Founded as a medical college in 1834, New Orleans’ Tulane University is one of 62 members of the Association of American Research Universities, an elite group of research institutions. The university provides a variety of online degrees, including a master of professional studies in homeland security studies. The program focuses on both securing and maintaining the day-to-day safety of American citizens through emergency management and security. Students who go through the program to earn their online master’s degree in homeland security work in fields such as intelligence analysis, counterterrorism analysis, cyber security, emergency management, border protection, general security, and infrastructure protection in the public or private sector. Class sizes in the program average 21 students each, providing students the opportunity to meet with faculty more easily. Members of the intelligence community aiming to advance their careers work as first responders, law enforcement officials, and emergency management personnel. Career paths available with this degree include forensic accountants, intelligence officers, and security analysts. Students earn the degree after completing 10 graduate courses comprising four core 600-level courses and six 700-level courses. The program does not require students to complete a thesis. Students complete the program entirely online. For admission, applicants need least a 3.0 GPA for all previous coursework taken. Admissions allows students who fail to meet this requirement to gain entrance into the program on a case-by-case basis. Pennsylvania State University was founded in 1855, and since 1892, PSU has offered distance learning through correspondence study. Fittingly, PSU was one of the first universities to establish online education, starting in 1998. Today, Penn State-World Campus features more than 120 degrees. PSU's master of professional studies in homeland security is a flexible, asynchronous program, made up of 33 credits with nine core credits in subjects such as violence, threats, terror, and insurgency. To earn this homeland security degree online, students complete courses in strategic planning and organizational imperatives in homeland defense and security. A third phase of study is made up of nine elective credits, allowing students a choice of over 25 courses in subjects such as disaster psychology, full range leadership development, and global cross-cultural leadership. The capstone course requires supervised study activities or research projects conducted by individual students or in small groups. Within the homeland security track, students have the option to give additional focus to their learning by choosing specific courses from among four concentrations in information security and forensics; public health preparedness; geospatial intelligence (which is fully accredited by the United States Geospatial Intelligence Foundation); and agricultural biosecurity and food defense. The homeland security master's degree also features an international track that prepares students for a global career in the field. Courses are typically 12 to 15 weeks in length and conducted on the Blackboard Collaborate platform. PSU has several initiatives to support students, such as the academic military support team. PSU also allows credit for life experience tests and the Defense Activity for Non-Traditional Education Support (DANTES) subject standardized tests. Standardized tests: GRE requirement can be waived with an overall 3.0 GPA, graduate degree, or five years of professional work experience. Non-native English speakers must submit a passing TOEFL or IELTS score. Based in Riverhead, New York, Long Island University's Homeland Security and Terrorism Institute was established at LIU in 2004. The HSTI was designated by an Act of Congress in the "Implementing the Recommendations of the 9/11 Commission Report Act of 2007" as a US Department of Homeland Security Center of Excellence. HSTI offers an online homeland security degree, the MS in homeland security management. All study is delivered in an asynchronous format through the Blackboard learning management system. The homeland security master's program comprises a total of 36 credits, offered in two possible concentrations. The homeland security concentration focuses on domestic and international terrorism, while the cyber security policy concentration focuses on the issues and policy of cyber security against terrorism. The homeland security master's offers three credits of practicum graduate internship as part of a planned observation and participation course in the management operations of a homeland security agency. Required core courses for this degree program include psychological and sociological aspects of disaster and terrorism. In addition, the program allows students to choose between taking three or six credits in elective course choices from a pool of over 18 course options. Subjects include specializing in securing transportation networks, understanding the economics of terrorism and extremism, and organizational skills such as funding and grant evaluation. The master's research thesis is carried out in a two-part sequence. Sam Houston State University combines its seven colleges and online department to offer an array of undergraduate and graduate certifications and degrees. The school’s master of science in homeland security studies features faculty recognized as one of the most productive teams of researchers in the nation by the Journal of Criminal Justice Education. Students can earn an online master’s degree in homeland security that enables them to become managers and leaders in the criminal justice and homeland security system. The program fosters knowledge of the pragmatics involved with homeland security through a focus on cutting-edge strategic security tools. Prospective students can seek admission in the fall, spring, or summer terms. Curriculum for the program covers several homeland security topics, from introductory foundations in homeland security to more niche topics like selected problems in geography, digital forensics investigation, global perspectives in homeland security, and critical infrastructure protection. Students may opt for an internship in homeland security or go without an internship and complete a capstone project before graduation. Students seeking admission to SHSU’s master’s in homeland security program need an undergraduate degree from an accredited academic institution in a related field as well as letters of recommendation from undergraduate professors or professional colleagues. They must also complete an essay that demonstrates their capacity to write at the graduate level. SHSU, located in Huntsville, Texas, receives regional accreditation from the Southern Association of Colleges and Schools Commission on Colleges. Nestled along the Atlantic Coast in Beverly, Massachusetts, Endicott College serves about 2,900 undergraduate students and 2,400 graduate students through its on-campus and online programs. Endicott offers several online degrees, including an MS in homeland security studies. Through this program, professionals in areas such as criminal justice, communications, and business secure the skills and knowledge needed to seek leadership positions in homeland security. Graduates who earn their master’s degree in homeland security online learn how to address multidisciplinary, complex, and strategic issues that occur in public- and private-sector environs. The program features 36 semester hours of coursework and offers cybersecurity and emergency management specializations. All instructors hail from homeland security backgrounds, including entities like the FBI, the Department of Homeland Security, and the U.S. military, giving them practical experience in the concepts that they teach. Endicott prides itself on establishing a collaborative learning environment through its online courses, highlighting personal advising and networking opportunities throughout the duration of a student’s time in the program. Required curriculum for the program includes an introduction to homeland security, as well as several in-depth courses like asymmetric threats to the american homeland, transportation security, intelligence issues in homeland security, and critical infrastructure protection. Students also complete a capstone project before graduation and additional courses that meet the requirements of their specialization track. Upon finishing this program, students can recognize the variety of homeland security functions, articulate and evaluate the nuances of security risks, and implement solutions to those risks. Thomas Edison State University offers an online master's in homeland security, a 36-credit program made up of 24 core courses covering theoretical subjects such as domestic and global intelligence for security management. This is combined with more practical courses in administration and finance for security professionals. After the core courses, students choose six credits in elective courses such as the psychology and sociology of disaster, and bioterrorism and biosecurity. A further six credits will be required from advanced-level courses, including a capstone in public service. The MS in homeland security is made up of six terms of 12 weeks, but may also be conducted in an accelerated format of 18 months. Courses include the study and application of methods in homeland security through the examination of real-world contexts, such as the consequences to the intelligence community in the wake of the attacks on 9/11. This is further exemplified by situational challenges, such as the detention of prisoners at Guantanamo Bay, Cuba. The MS in homeland security at the university's John S. Watson School of Public Service and Continuing Studies enables graduates in the top 20th percentile of their class to join the prestigious chapter of the Order of the Sword & Shield National Honor Society. Students who have studied at a regionally accredited community college may transfer up to 12 credits earned with a grade of "B" or better. TESU also accepts translatable credit from military training and education, as well as certain professional training relevant to the program. The Master of Science in Homeland Security and Emergency Management (MSHSEM) is an interdisciplinary research degree program that explores the theoretical and practical aspects in the demanding fields of management in emergency response, counter-terrorism, and homeland security. National University has offered online programs since 1996, including the entirely online MSHSEM program. The program is designed to prepare students for managerial and leadership roles in agencies that will be expected to respond to, and recover from man-made crises and natural disasters. The program is made up of 54 quarter units spanning 12 courses, typically four weeks in length. The MSc has a set curriculum that covers subjects such as infrastructure protection, leading complex environments, and methodological studies such as immigration issues in security. The MSHSEM capstone project is divided into two course phases. Up to nine quarter units may be earned in a transition program during undergraduate studies to give eligibility to the MSc program. Applicants may transfer up to 13.5 quarter units of graduate credit in equivalent graduate work completed at another institution, on the basis that it is relevant to the MSc in homeland security, and on the provision that the transferred units have not been not used in earning another advanced degree. All transfer credits are considered on an individual basis. Accelerated study options are available to students through the DANTES Subject Standardized Tests. The online MSc allows rolling admission and has all-year round monthly start dates. Based in New Castle, Delaware, Wilmington University is a global university offering more than 90 degrees, concentrations, and certificates fully online. WU's master of professional studies in homeland security can be completed in hybrid form at Wilson Graduate Center as well as fully online. The online homeland security degree requires a minimum of 33 credit hours, and students must maintain a grade point average of at least 3.0 to graduate. The program is comprised of six core courses, including sociology of terrorism, crisis leadership, and research methods in criminal justice. The program has three possible concentrations: military leadership, organizational leadership, and safety and security. All specialization courses require 12 additional credits chosen from five additional course options. These will culminate in a capstone course where students conduct a field practicum. The military leadership concentration in particular has additional requirements: all prospective students for this concentration must have successfully graduated from the Delaware Leadership Academy under sponsorship of the Delaware National Guard. This concentration frees students from the core course in crisis leadership, allowing the student to take a fifth specialization which is an advanced course in crisis management specific to National Guard leadership. Wilmington University's MS in homeland security must be completed within five years of enrollment. Up to six credits from an accredited graduate program may be transferred towards the final degree, especially those with an educational background with the Northwestern School of Police Staff and Command, or those who had completed courses from the Federal Bureau of Investigation National Academy. Credit requirements: 33 credits. Must maintain a 3.0 GPA to graduate. Considered among the best graduate schools in the nation, Arizona State offers both online and on-campus programs to its students. ASU’s online MA in emergency management and homeland security prepares students to effectively manage hazards and crises in the emergency management and homeland security space. The school offers four concentrations: biosecurity and threat management, community resilience, emergency management, and homeland security. Each concentration involves a specific course sequence that prepares students for the unique challenges of their particular field. ASU requires students to complete 33 credit hours across 11 classes. Of these, 18 credits derive from six core classes, including program evaluation for emergency management and homeland security, applied data analysis in criminal justice, and integrated emergency management. Students must complete an additional 12 credits through elective courses in criminal justice, emergency management, and public administration. The program culminates with an applied project designed to enable students to make a direct impact on their communities. Full-time students at ASU receive their online master's degree in homeland security in as little as one year. In addition to the online courses, ASU also provides students with the opportunity to take courses in Australia or the United Kingdom through its PLuS Alliance membership. To be accepted, prospective students need a cumulative GPA of 3.0 or above from their bachelor’s or applicable master’s degree program. Additionally, they must provide proof of current employment or two years of experience in a relevant field. Northwestern State University of Louisiana has provided higher learning opportunities to the people of Louisiana for more than 130 years. NSU now offers accredited online homeland security degrees through its eNSU Global Campus, allowing the university to expand its reach to students outside of the state as well. Delivered through NSU's online learning management system and Moodle, the online MS in homeland security has a unique 36-credit thesis option and a 42-credit non-thesis option. The latter option requires students to complete a practicum or transformational learning project in lieu of a thesis project, allowing the student to test their own ability in applying their newfound knowledge and skills in real-world environments and situations. Courses available include executive leadership, diplomacy and ethics in homeland security, and managing chaotic organizations. These courses are designed to prepare students for management roles in advanced criminal investigation. The program also builds expertise in counterterrorism and covert operations, as exemplified by courses such as domestic terrorism prevention and analysis. The university's programs run as sixteen- or eight-week sessions in the fall and spring, and students typically take one or two courses at a time. NSU offers summer courses as well in three-, five-, and six-week sessions that give students greater schedule flexibility in addition to the opportunity to accelerate their progression through the curriculum. Out-of-state students enrolled in this online master's in homeland security are exempt from paying out-of-state fees, though NSU encourages all students to speak with a financial advisor. Transfer credits are judged on an individual basis using the American Association of Collegiate Registrars and Admissions Officers to evaluate credits from other institutions. Prerequisites: Bachelor’s degree in criminal justice, public administration, or related field. Homeland Security 5050 must be taken in the first semester for other degrees. Founded in 1851 in Philadelphia, St. Joseph’s University is internationally recognized for its many online and in-person programs. The school’s MS in criminal justice with a concentration in homeland security prepares students to respond to acts of terrorism and crisis situations. Upon graduation, students serve in roles like mission support, law enforcement, immigration and travel security, and prevention and response. The university offers the concentration in homeland security through its criminal justice program. Students complete 10 three-credit courses for a total of 30 credit hours. The homeland security concentration requires learners to take four core courses in the criminal justice program, covering topics such as research methods and analysis, criminological theory, and ethics. Students also take four concentration courses that cover more specific homeland security concepts, including terrorism, risk assessment, and the sociology of disasters. Students fulfill the remaining six credits by taking elective courses from any of the school’s online course offerings -- with the exception of behavior analysis courses. Students complete all coursework for the MS in criminal justice homeland security concentration entirely online. The school pairs students with a student coordinator who directs them to additional resources as necessary. The school also offers 24/7 technical assistance to online learners. Applicants to this program need a cumulative 2.8 undergraduate GPA, and most students earn their online master's in homeland security in two years. Located in Garden City, New York, Adelphi University offers a master of science in emergency management with a homeland security track. Students complete the 39-credit program entirely online, giving students the freedom and flexibility to maintain their family and working lives. The school designed the program with working professionals in mind, and full-time students complete the program within two years. Before entering the program, students must take and pass computer applications and mathematics for engineers. Afterward, they take 33 credits related to emergency management, health management in times of disaster, business continuity planning, emergency management law, organizational behavior, and leadership and innovation. The program also requires two homeland security courses: public policy and administration in emergency management and securing the homeland. Adelphi University’s online master's in homeland security culminates with a capstone research project. This experience serves as a way for students to showcase coursework learning, while also providing them with an opportunity to develop a portfolio. To be eligible for admission, prospective students need a bachelor's degree with a cumulative GPA of a 2.8 from an accredited college or university. Each application includes a 500-word personal essay explaining program interest and two letters of recommendation. The school offers the same tuition rates to in-state and out-of-state students. Adelphi University is regionally accredited by the Middle States Commission on Higher Education. Located in Queens, New York, St John's provides a quality higher education experience to students of all economic and social backgrounds. Additionally, the school’s commitment to personalized instruction extends to its online programs. St John’s offers students an MPS in homeland security and criminal justice leadership that prepares learners for emerging challenges in homeland security, criminal justice, corporate security, and related public sectors. The 36-credit program requires learners to study leadership, ethics, and organizational decision making in all areas of criminal justice. To earn a master's in homeland security online, students must complete 18 credits of core classes, which build foundational knowledge in criminal justice policy and ethical leadership in homeland security and public administration. An additional 12 credits of elective courses include studies in terrorism, global security, and court administration and leadership. Students must also fulfill six credit hours through research courses. The program culminates with a capstone class centered on an applied research project. Professors at St John’s deliver lectures and assignments asynchronously to distance learners using the Blackboard LMS. The system houses all virtual class materials, exams, and discussion forums. The school also offers online students access to several support services, including library databases and resources, career services, mentoring, and technical support. Applicants for the program need a cumulative GPA of a 3.0 or above. Additionally, those who currently work in criminal justice, homeland security, and related fields are eligible for a 33% tuition scholarship. Located on New Jersey's northern coast, Monmouth delivers more than 50 online courses each semester, such as MU's homeland security degree online -- the Master of Arts in Criminal Justice (Homeland Security Concentration), a 30-credit graduate program. Prospective students should hold a baccalaureate degree with a minimum GPA of 2.5, including a minimum GPA of 3.0 in their academic major. The program focuses on cyber security and the psychopathology of crime and terrorism. There are additional opportunities for flexible study with the thesis or non-thesis tracks. Other possible courses cover subjects such as terroristic crime scene investigation and weapons of mass destruction. Monmouth University is partnered with the Center for Homeland Defense and Security at the Naval Postgraduate School in Monterey, California, which provides a basis for the program curriculum based on their nationally recognized system. MU also participates in the University and Agency Partnership Initiative, giving its students access to the Homeland Security Digital Library. MU hosts its own military bridge program as well, which allows service personnel and veterans a transitional semester as undergraduates. Other benefits and support initiatives for those with a military background include MU's servicemembers' opportunity colleges program, which allows prospective students to translate military service experience into course-equivalent credits. Students may also utilize the Defense Activity for Non-Traditional Education Support program, which allows MU students to earn college credit by taking exams without enrolling in classes. Arkansas Tech offers an MS in emergency management and homeland security to prepare students to pursue emergency management employment opportunities in both the public and private sectors. The curriculum fosters critical thinking and research skills, along with emergency management-specific capabilities such as preparedness for quick response and recovery efforts. Arkansas Tech requires students to complete a total of 36 credit hours to obtain their online master's in homeland security. Students select either the thesis or the practicum option. Regardless of which option they choose, students must complete nine credits of core classes that build a foundational understanding of research methods and principles of emergency management. Thesis-seeking students must complete nine credits in research and applied data analysis, 18 elective credits, and a successful oral defense of their thesis. Students who choose the practicum option must secure 21 elective credits and pass a comprehensive examination. Learners complete the remaining six credits through both an action research practicum and a capstone research practicum. Elective courses strengthen learners’ understanding of specialized areas, including disaster relief, terrorism, crisis communications, and digital technology applications in emergency management. Students may also take up to six elective credits from fields of study outside of emergency management and homeland security. The program director assists distance learners with creating a curriculum that leads to graduation. To complete all requirements, students must maintain a cumulative GPA of a 3.0 or above. The program is fully accredited through the Foundation for Higher Education Accreditation. Based in Newport, Rhode Island, Salve Regina University offers a comprehensive education tailored to the needs of adult students. Learners receive unique opportunities for personal and professional development through the school’s online master’s degree programs. Salve Regina’s MS in administration of justice and homeland security program provides students with a holistic understanding of the security threats found in an increasingly technological and global world. Program coursework covers analytical approaches to criminal justice system practices and theories through 36 credits of coursework. Students seeking their online master's degree in homeland security choose one of three specialized concentration options: cybersecurity and intelligence, digital forensics, or leadership in justice. Each concentration hones in on a specific area of criminal justice and homeland security. The school expects all learners to complete eight core classes that explore foundational criminal justice topics, including theories of justice, cultural competency, terrorism and transnational crime, and criminal justice research methods. Learners select the remaining four courses based on their area of concentration. Each concentration includes one or two required courses and a specified list of optional electives. Additionally, students may elect to not choose a concentration and take four courses selected from other graduate programs. Students can complete the MS in administration of justice and homeland security program entirely online with no in-person requirements. However, learners have the option to take evening classes taught at the university’s Newport and Warwick campuses. Salve Regina University is regionally accredited by the New England Association of Schools and Colleges. Located in Teaneck, New Jersey, Fairleigh Dickinson offers students nationwide the ability to earn degrees and professional certificates completely online. Through the school’s MS in homeland security program, students explore practical and theoretical concepts related to leadership and homeland security. Fairleigh Dickinson expects learners to complete 36 credits—in the form of 12 courses—to graduate. All students take four courses that provide a basic understanding of homeland security concepts. These include homeland security and constitutional issues; research and policy analysis; weapons of mass destruction/terrorism awareness; and strategic planning, implementation, and evaluation. The final course counts as a capstone for the program; learners take this course after completing 27 credits of coursework. The university offers students seeking a homeland security master's degree online the opportunity to receive a certificate in one of three specialized concentrations: terrorism and security studies, emergency management, or leadership. Each concentration requires the completion of six specified courses, and students complete the remaining credits through two elective courses. To apply for this MS in homeland security program, applicants must hold a cumulative GPA of 3.0 or above from a previous undergraduate institution. Additionally, prospective students must provide proof of employment in an area of homeland security through a written recommendation letter from an employer. Additionally, the university offers all eligible applicants a 50% tuition scholarship. Aurora University provides learners of all levels the opportunity to participate in a growing list of programs in-person at its Aurora, Illinois, campus, and through its online learning environments. The university offers several completely online programs that give students the personal attention they need to achieve their academic and professional goals. Developed in partnership with the Naval Postgraduate School Center for Homeland Defense and Security, the school’s MA in homeland security program caters to both public and private homeland security professionals. The program helps students gain a foundational understanding of emergency preparedness and response and provides them with practical field experience. Ten core courses provide students with the 30 credit hours necessary for program completion. Learners explore concepts related to homeland security, including cyber security, disaster preparedness, the psychology of fear management and terrorism, and critical infrastructure. The program culminates with a final capstone course: multidisciplinary approaches to homeland security. The school offers courses in the MA in homeland security program year-round in eight-week course modules, and full-time students typically complete the degree in one year. Students pay the same tuition rates regardless of residency, and admissions automatically considers students for scholarships upon acceptance. To qualify for admission, prospective students must hold a cumulative GPA of a 2.75 or higher from all previously attended undergraduate universities and provide a statement of purpose describing their motivation for program entrance. Aurora University receives regional accreditation through the Higher Learning Commission. From concentrations to curriculum and program structure, the options a program offers for earning a homeland security master's degree online will help you determine which program is right for you. As you explore the best homeland security degrees online, keep in mind that the details of these programs will vary from school to school. Crisis Communication: Examine how to communicate within organizations and with the public during a crisis, from natural disasters to sexual harassment accusations. This course often includes analysis of case studies from real life crises, allowing students to determine where an organization may have gone wrong in their own crisis communication efforts. Taking this course prepares you for a variety of careers with organizations like the Federal Emergency Management Agency. Critical Infrastructure: Developing a plan to detect the vulnerabilities of critical infrastructure -- and how to protect it during a crisis -- is a cornerstone of homeland security studies. In this course, you'll learn how to conduct model-based vulnerability analysis, assess risk within systems, and apply risk-reduction techniques. Taking a course on critical infrastructure is a must for those who want to work at the Department of Homeland Security. Terrorism: Learn about how to detect and monitor threats of terrorism, both foreign and domestic. This course covers the history and ideology of terrorism and helps you identify major terrorist groups operating today and the role homeland security plays in diminishing the threat of terrorism in the U.S. Courses on terrorism are a good foundation for careers in federal agencies like the DHS, FBI, and CIA. HOW LONG DOES IT TAKE TO GET AN ONLINE MASTER'S IN HOMELAND SECURITY? Full-time students can typically earn an online homeland security degree in two years. Programs often require you to complete 30 to 40 credit hours. 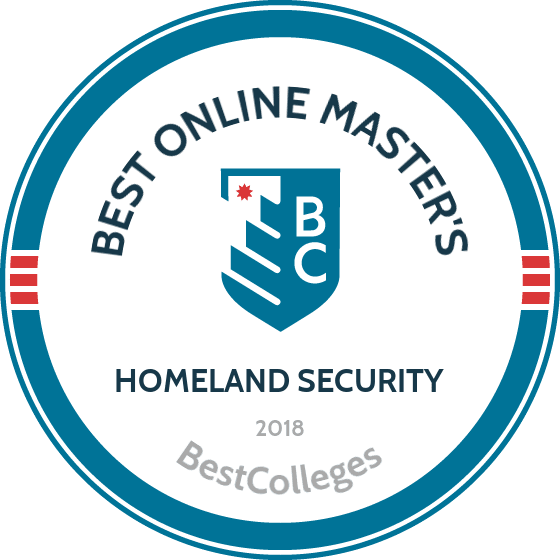 How long it takes you to complete your online master's in homeland security will depend on how many credits you take and whether you have any transfer credits. As you develop your shortlist of the best homeland security degrees online, consider whether a program follows a cohort model or allows you to study at your own pace. In a cohort model, you will start your online graduate program at a set time and work through the program at a predetermined pace with your peers. Some homeland security online degrees allow you to work through the program at your own pace. That means you may be able to take more credits per semester or complete coursework during summer semesters, allowing you to earn your degree quicker. Geographic Information Systems Professional Certification: Many careers in homeland security require thorough knowledge of GIS analysis. GIS users choose to receive certification from the GIS Certification Institute. Before professionals can apply for the GISP certification exam, they must have at least four years of experience in a geospatial career. Certified Information Systems Security Professional: Designed for professionals in the information security field, this certification is granted by the International Information System Security Certification Consortium. It certifies that a professional is competent in their field and capable of designing systems that protect against cyber attacks. Online master's in homeland security programs vary widely, and it's important to make sure that the programs you're interested in are accredited. Accreditation indicates that a school has met certain standards. The schools you encounter will most likely have one of two types of accreditation: national accreditation or regional accreditation. National accreditation is usually reserved for institutions of higher learning that focus on a specific type of education, like distance learning or vocational training. Regional accreditation is given to an institution that has met the standards of a regionally accredited association. There are six regional accreditation associations throughout the U.S. covering different regions, and a degree from a regionally accredited institution is valid in any state. There is no one organization that's specifically designed to accredit schools within the field of homeland security, but FEMA does keep a list of masters programs for homeland security. You can find FEMA's college list here. Accreditation associations work in tandem with other organizations to establish the standards that institutions of higher learning must meet. Those organizations include the Department of Education (DOE) and the Council for Higher Education Accreditation (CHEA). DOE, a cabinet-level department in the U.S. government, approves accreditors deemed reliable by the Secretary of Education. This is important because the DOE can only provide financial aid to students who attend accredited institutions. The CHEA advocates for self-regulation among accredited institutions of higher learning to maintain high standards. To learn whether a school you're interested in is accredited, you can check the list of schools on the websites of the DOE and CHEA. Due to an increased demand for qualified homeland security professionals in recent years, the job outlook is fairly strong for master's degree recipients in this field and healthy growth has been projected in the coming years ― although these trends vary by specific professional title. Using data from the Bureau of Labor Statistics (BLS), the following table has a detailed breakdown of five common career paths in homeland security. Comparatively, the BLS estimates that the average job growth projection for all industries between 2014 and 2024 is 6%. Earning potential in the homeland security profession is largely tied to one's master's degree field and area(s) of specialization. Using data from the 2016-17 PayScale College Salary Report, the following table features earning estimates for four different homeland security-related master's fields during their first decade in the workforce. Please note that data for the master's in homeland security was not included in the 2016-17 report. Of the five degree fields listed, the average wage premium (or increase) between the entry-level and mid-career stages is 49.82%. In addition to academic studies, specific job titles also determine how much a master's-holding homeland security employee can expect to make. Other factors include employer size and city/state of employment. The next table looks at 20-year salary growth projections for five popular careers among homeland security professionals with master's degrees. All four occupations experience a salary growth rate of at least 29% after 20 years on the job. Intelligence analysts reported the highest growth rate: a 57% increase in earnings between the entry-level and late-career stages. Emergency management specialists ranked second with 56.4% salary growth, followed by disaster recovery coordinators with 54.4% growth. Those who graduate with a master's degree in homeland security will be qualified for dozens of positions ― including some managerial roles ― although their eligibility will depend on their areas of expertise. Four common career routes for employees with a master's in homeland security are outlined below. Emergency Management Directors: Emergency management directors oversee teams that coordinate response and relief efforts when disasters, attacks and other critical situations arise. They strive to create safe, efficient contingency plans for a wide range of emergency scenarios, many of which depend on support from federal agencies, nonprofits and other peripheral organizations. Nearly two-thirds of emergency management directors work for state or local government agencies. Project Coordinators: Also known as project managers, project coordinators are responsible for the development and execution of short- and long-term projects; in the homeland security sector, these projects often revolve around emergency and disaster response, relief and reconstruction models, as well as optimizing communications between different organizations and agencies with shared homeland security goals. Information Security Analysts: Information security analysts are responsible for safeguarding sensitive organizational data from different hackers, cyberterrorists and other online criminals, as well as technical problems like equipment malfunctions and viruses. They rely on an array of tools and platforms to do their jobs ― and in some cases, they may be responsible for developing new programs that address the shortcomings of current ones. Epidemiologists: Epidemiologists study patterns and trends pertaining to diseases and injuries that impact human health. They publish their findings in medical journals, give speeches at seminars and conferences on behalf of their organizations, and often have a hand in policy-writing. Making professional connections and learning about different approaches to homeland security is crucial to your success. Professional organizations offer a great entry point for students who want to learn more about their chosen career path. Below you'll find three of the country's most prominent organizations established for homeland security professionals. These organizations host networking events, provide online trainings, maintain active job boards, and offer other services for career-ready college graduates. Resources like these often prove invaluable as you complete your degree requirements and prepare to enter the job market. National Homeland Security Association: The NHSA sponsors a national homeland security personnel conference, which was first held in 2005. The association's website also features an extensive blog network, career tools and archived transcripts from the most recent conferences. International Association for Counterterrorism and Security Professionals: The IACSP's mission is centered around two overarching goals: the development and dissemination of tools and resources used to minimize the threat of terrorism, and promotion of legal and ethical behavior within the counterterrorism field. Member benefits include online journal and newsletter subscriptions, discounts on entrance fees to IACSP events and access to additional resources on the organization's website. SEARCH: SEARCH is a national nonprofit organization that seeks to connect and improve communication between various state, local and tribal law enforcement and public safety agencies. SEARCH's website is a compendium of resources; visitors will find information about cyber-crime, data analysis, public safety and other niche areas of law enforcement and homeland security, as well as podcasts, blog posts and other multimedia resources.